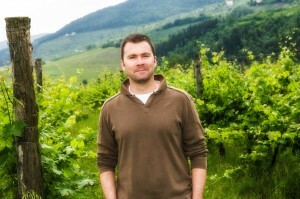 Wine aficionado Todd Bolton on Tuscan vineyards, French Syrahs, and missing Mexican food. In a column devoted to firsts and lasts, it seemed only fitting for me to talk to Todd Bolton, owner and operator of Tuscan Trails wine tour company in Florence, Italy. After all, it was under his guidance that I experienced my first truly memorable encounter with wine. As an undergraduate living in Florence for a study abroad program and just a month shy of legal U.S. drinking age, I found myself awash in bottles bearing grape names I’d never heard of and nameless carafes of vino rosso served alongside pizzas piled high with fresh arugula or rigatoni cloaked in fresh tomato sauce and buffalo mozzarella. The red wines I downed nightly with my fellow classmates were palatable, plentiful and affordable, but largely a mystery to me. Where did they come from? What do words like “jammy,” “fruity,” and “dry” mean, exactly? I wanted to know more. So when I spotted a simple flyer affixed to the lobby bulletin board in a university building advertising day trips to vineyards in the Tuscan hillsides, I jotted down Todd’s phone number and rallied a small group of friends to come along. Early one morning, Todd met us in his van at the edges of town near the banks of the Arno River. As a California native who transplanted to Italy for love (his wife is Florentine), he quickly put us – a rag-tag group of American college students – at ease with unfussy explanations and an approachable tone. We spent the day winding down single-lane roads, popping into family wineries and learning about local viticulture and tasting notes. By the time we finished our lunch at a small family-run trattoria perched on a hillside – where platter after platter of fresh pasta, salty fritto misto (mixed fried vegetables), stewed white beans with sage, and roasted chicken arrived endlessly from the kitchen and empty bottles of wine crowded out our glasses – I was ten pounds heavier, a bit drunk, and totally transformed. It’s a wonder I ever came home. Since then, I’ve sent visiting family Todd’s way for a tour of their own and picked his brain for must-eats during my return visit to Florence this past summer. Then, last week as I was contemplating where to focus my next column, my mind wandered back to Florence, a place my mind, heart, and stomach travel to quite often. Especially on the days I’ve spent hours squinting at a computer screen, gazing at clocks in conference rooms, and pondering dangerous existential questions. I thought of the Florentine streets clogged with panhandlers, buses, and seas of tour groups; of the dime-a-dozen compliments from the flirty waiters at the trattoria on my block; of the sound of the market merchants rolling their wooden carts along the cobblestones at the end of the day; and of the smell of warm lampredotto (tripe) sandwiches for sale in the San Lorenzo market. I thought of all the firsts I found there; of how those memories feel forever new to me, forever young. I decided that if I couldn’t be there right now, I wanted to talk to someone who was. So last week, I spoke with Todd about life as an American in Florence and the firsts and lasts of his life – from California to Italy, from French wine to American rib-eye. My grandfather was from southern Italy. He was born in the States, but both of his parents were of Italian descent. One of the things that always stood out to me was the cioppino (fish stew) he made every Christmas Eve. While he was preparing dinner, he would be popping open clams and having me try them on the half-shell. What about a memorable first wine? My wife would kill me for saying this, but one of my ex-girlfriends went to visit her mom in Amsterdam and brought back all these bottles, of predominantly French wines, mostly Bordeauxs and a few Burgundys as well. That was probably where I first tasted [wine] and realized something totally new that sparked my interest. Other than those early memories of your grandfather, was food a big part of your childhood? When I was growing up in California, the Betty Crocker Cookbook was still standard in most homes. But my mom was really creative. She had a wok and would experiment with various Asian dishes. I can still remember the smell of sesame oil from some of her stir-fry dinners. How did you come to live in Florence? My wife is from Florence. We met in San Francisco and eventually we were living together and she was missing home and I was looking to leave my job. It seemed like a good opportunity. I had never been to Italy and was excited to see what it was all about. We decided we would come over for 4-6 months and just see what happened. At the time I didn’t speak Italian. It’s been over 10 years now. Where did the idea for Tuscan Trails come from? When I came over to Italy, I immersed myself in the language and culture. We lived with my wife’s family for several months. I studied Italian at these Florentine immersion programs for months. Got decent with the language pretty fast, and then I wanted to continue studying, but not grammar! So, I started to study the wines. I was already into wine in California. Not to mention that when I first got here I tasted all these great wines and the prices were a fraction of what they would have been in the U.S. for the same quality. There is a national program in Italy called the Associazione Italiane Sommelier (AIS). It takes about two years to become a sommelier here. I completed the program in 2005, but about halfway through I started thinking about how I could share this knowledge. 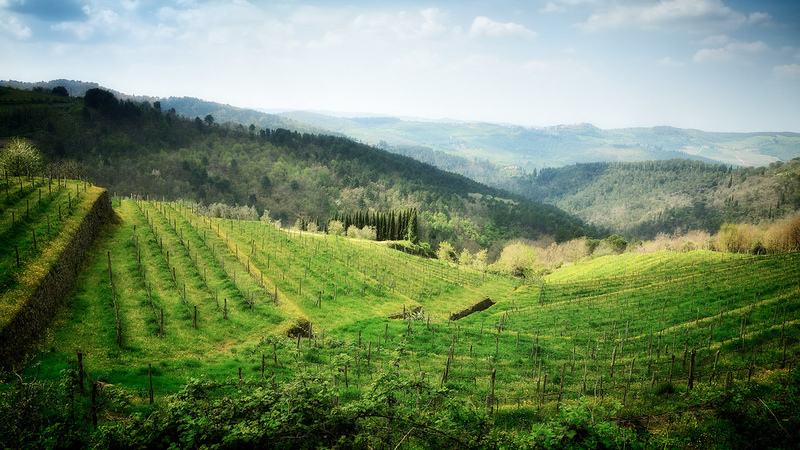 The natural fit was informing travelers via a “mini immersion” into Tuscan wines. What is it about Tuscan wine that fascinates you? The diversity; you can never get bored. There are literally thousands of different grapes in Tuscany. Everywhere you go, every winery you go to, they’ll say, “we’re doing it this way with this grape, this is why we’re doing it, and it’s the best way you can do it.” And they’re producing fantastic wine. Then you go somewhere else and they’re doing it completely differently and it’s still phenomenal wine. How is a Tuscan wine tour different from a tour in the Napa Valley? I think having lived near Napa and Sonoma – and I love California and in no way, shape, or form would I want to criticize California or its wines – but one of the things that’s different is that, in America, there is often a distinction between grape growers and wine producers. California wineries more often buy grapes from farmers and then make their wine. In Italy it’s different. Wineries are often somebody’s actual home. People are working with the product from start to finish. They totally own the creative process. What do you try to show or teach travelers abut wine? The bulk of my focus is on helping my clients understand what they like based on what is happening on their palate. I try to move folks away from the misinformation in the wine industry. We are a young wine culture in the United States, which makes us vulnerable to marketers. No one should tell you what you need to drink. As far as I’m concerned you can drink whatever wine you want, wherever you want. Do you think you’ll live in Florence for life? I absolutely love living in Florence. I love Tuscany. I love being able to easily travel throughout Europe. But at the same time I love California, for different reasons. I miss wide open spaces. Europe has much more urban density. I miss friends and family, but also Mexican food: cilantro and good avocados. Are there any trends you see happening in Tuscan food culture right now? A lot of young people are going back to the farms. They’re trying new things and doing it in really creative ways. You see some people going beyond organic and actually pulling tractors out of the fields or even using a horse and plow. In the States, we’re also seeing a wave of young people returning to farming, but they didn’t necessarily grow up on one. Do you have pioneers like that in Italy, or are they largely family farms? Sometimes they’re pioneers, but I think that farms here have been less removed from the act of eating than in the U.S. In the States, we’ve had industrialized agriculture for a while, but here most people have someone in the family who still has a little land, a couple hundred olive trees, a vineyard, something like that. What about trends in Tuscan restaurant kitchens? Italy has had distinctive regional cuisines for centuries because no one really communicated with each other; they talked differently, they didn’t get back and forth very often. It’s only been in the past 20-30 years, and especially in the past 10 years, that you’ve seen this massive influx of information in Italy. Folks are starting to play with fusion and be more global in their kitchens. If you could have one, final food and wine pairing before you die, what would it be? I’ll answer this, but you have to know, that it would probably change again in five minutes, and again the next day, and the next day. That’s okay, no one is going to hold you to this. Well, part of what kills me is that I’m here in Florence doing wine tours and I don’t know why but French wines keep popping into my head. (laughing) Okay fine, I’ll just make it simple. It’s going to be a rib-eye on the grill and a Syrah from the northern Rhone, but a really dry Syrah, something from the Crozes-Hermitage. Now thinking about my answer – an American-style steak with a French wine – my friends in Tuscany will probably smack me over the head with an empty wine bottle for saying that. Martha J. Miller is the food columnist for EthnoTraveler. Her writing also appears in the Washington Post and the Oxford American.